Above: The harbor in Sami. Below: Looking across Sami Bay to Ithaca, home of Odysseus. Above: The inhabitants of Sami resisted the Roman conquest from the hills overlooking the town. Traces of ancient defenses can still be found. 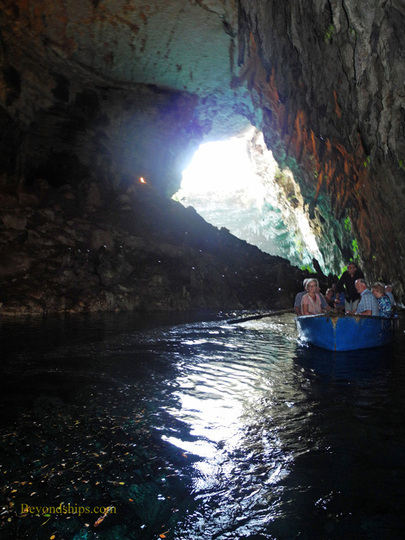 Above: Entering the enclosed chamber of Melissani Lake. 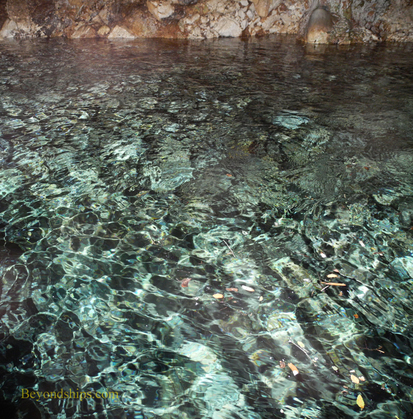 Below: In the shallows, the clarity of the water becomes evident. On the other side of the island from Agrostoli is Sami. 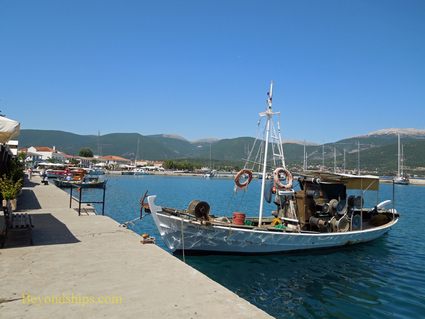 A small town, its most impressive feature is the harbor with fishing and ferry boats. This is the primary location where the movie “Captain Corelli's Mandolin” was filmed. (The film and the book upon which it is based were inspired by the aforementioned revolt of the Italian soldiers during World War II). 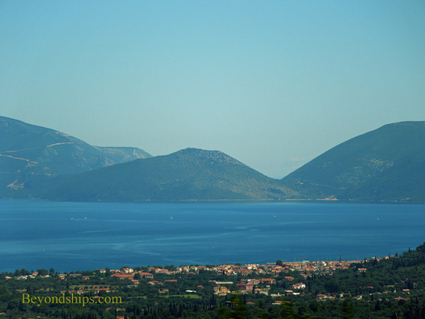 The ferry boats link Cephalonia to the neighboring island of Ithaca, which is clearly visible from Sami. Ithaca, course, was the home of Odysseus and his struggle to return there is the plot of Homer's epic poem “The Odyssey.” According to legend, Odysseus also ruled Cephalonia and he paused here within sight of his goal. It is interesting to ponder what his thoughts must have been as you look across at Ithaca's green mountainsides arising out of the sea. 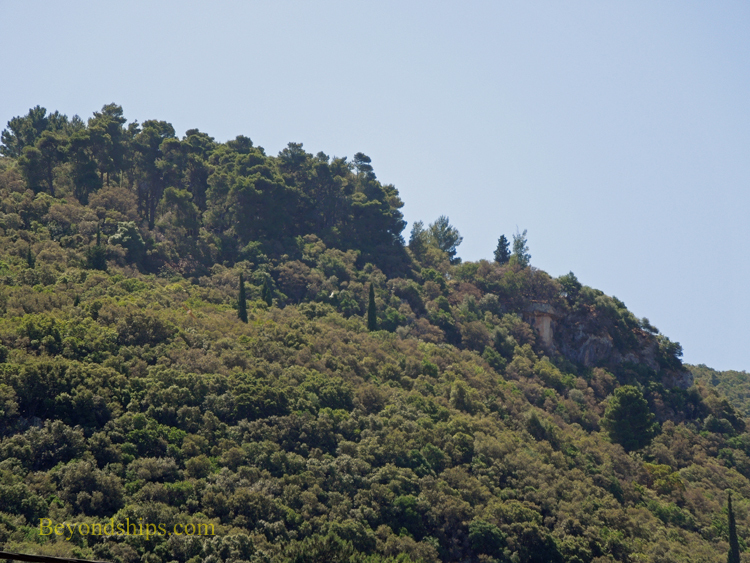 Near Sami is one of the highlights of a trip to Cephalonia. 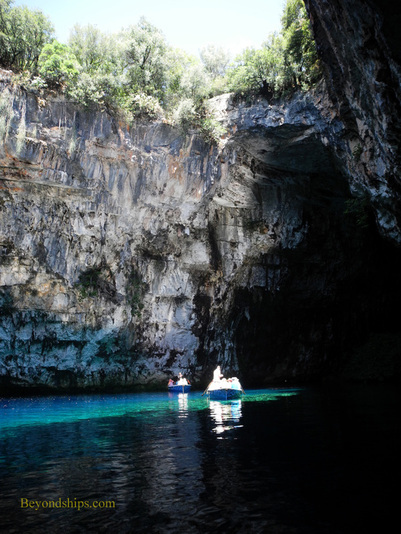 Melissani Lake is a unique setting - - a lake that is partially underground and partially open to the sky within a deep cavern. This arrangement results in an unusual play of light on the clear water, which ranges in depth from a few inches to over 100 feet. The water in turn reflects the light back onto the vertical stone walls of the open chamber. Meanwhile, artificial colored lights have been placed inside the enclosed portion of the lake. It is an other worldly experience. 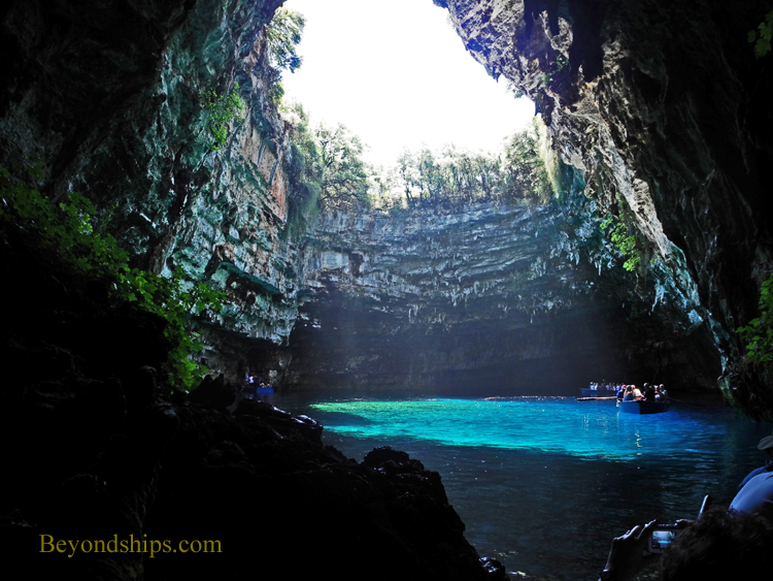 You can easily see how the ancient Greeks were inspired to call this place “The Cave of the Nymphs.” At any moment, you expect to see a nymph emerge from the depths or to see some nymphs cavorting with a river god or two on the small island that separates the enclosed chamber from the open-air section. This is the kind of place that you might expect Jason or Odysseus to visit on some quest. Indeed, some ancient artifacts have been found at this site. These include an oil lamp, a clay figure thought to represent the god Pan and a terracotta slab depicting Pan and three nymphs. According to legend, the name of the lake comes from the nymph Melissani who fell in love with Pan and drowned herself in the lake when he rejected her. The lake is not far from Sami in the midst of some fields and orchards. There is a large parking lot with a small building in the middle that acts as a combination entrance to the cave, snack bar and souvenir stand. After buying a ticket you walk through a somewhat steep tunnel that has been carved out of the rock to the level of the lake, which is perhaps 50 feet below the level of the surrounding fields. At the end of the tunnel, is a small pier. Here, boatmen assist you into one of several small boats that tour the lake. Each boat holds perhaps a half dozen people. Visitors do not have to take the boat ride but since the lake laps against the vertical walls of the chamber, you cannot go far unless you take the boat ride. Looking eerily like the paintings of Charon ferrying souls to the underworld, the boatman stands in the stern during the voyage. The boat first makes a circuit of the open chamber. Although this is not a great expanse of water, the scene changes as the boat moves from sunlight into shadow and out again. Then, the boat enters the narrow channel that takes you into the enclosed chamber. Here, there is not enough room to row so the boatman pulls the boat along with a rope attached to the wall and/or uses his oar like a punt pole. Once inside, the colored lights play upon the 20,000 year old stalactites and it would not be a surprise if the Cyclops suddenly appeared demanding to know who had entered his domain. In addition to being a treat for the imagination, Melissani is a refuge. Regardless if the temperature is 100 degrees at street level, this other world is cool and refreshing.